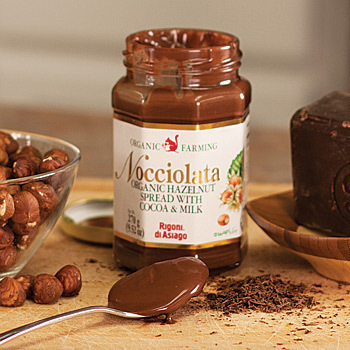 Nocciolata Organic Hazelnut Spread is a wonderful, tasty organic chocolate hazelnut spread that is organically grown. Wonderful on toast and as a replacement for peanut butter. Certified USDA Organic. Soft, fragrant, and with all the flavor of Italian hazelnuts, Nocciolata is almost a sin of gluttony. It is a spreadable cream of cocoa and hazelnuts with ingredients that are all organic. In a traditional manufacturing facility, Rigoni di Asiago, raw materials are carefully selected and mixed with patience and skill. What you get is a delicious chocolate spread, made of an organically farmed hazelnut paste (16%), and sweetened with organic cane sugar. Among the other ingredients stand sunflower oil, skim milk powder, and cocoa butter. 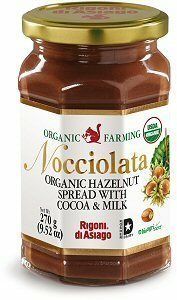 Nocciolata Organic Hazelnut Spread with Cocoa & Milk is organic, non-GMO, Kosher certified, and gluten free. My Family's Experience: I received a sample of Nocciolata Organic Hazelnut Spread to review. My 17-year-old daughter has long been a fan of Nutella and so she was eager to give Nocciolata a try. In her opinion, Nocciolata is much creamier than Nutella and has an all-in-all better taste. Kendallyn spread it on toast (her favorite breakfast) and she even dipped sliced apples in it. I enjoyed Nocciolata on my graham crackers for a delicious snack. I will be purchasing Nocciolata from now on instead of Nutella because I appreciate that it is organic and is made with natural ingredients.